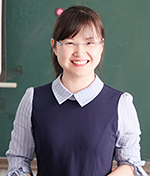 Qiaohong gained her PhD (2018) and MSc (2015) from Beijing Normal University. In 2016, She visited University of California, Irvine as a joint PhD. student. Sun Q., Miao C., Duan Q., Ashouri H., Sorooshian S., Hsu K., A review of global precipitation datasets: data sources, estimation, and intercomparisons. Reviews of Geophysics, 2017, doi: 10.1002/2017RG000574. Sun Q., Miao C., Duan Q., Changes in the Spatial Heterogeneity and Annual Distribution of Observed Precipitation across China. Journal of Climate, 2017, doi:10.1175/JCLI-D-17-0045.1. Sun Q., Miao C., Qiao Y., Duan Q., The nonstationary impact of local temperature changes and ENSO on extreme precipitation at the global scale. Climate Dynamics, 2017, doi: 10.1007/s00382-017-3586-0. Sun Q., Miao C., AghaKouchak A., Duan Q., Century-scale causal relationships between global dry/wet conditions and the state of the Pacific and Atlantic Oceans. Geophysical Research Letters, 2016, doi: 10.1002/2016GL069628. Sun Q., Miao C., Duan Q., Comparative analysis of CMIP3 and CMIP5 global climate models for simulating the daily mean, maximum and minimum temperature and precipitation over China. Journal of Geophysical Research-Atmospheres, 2015, doi:10.1002/2014JD022994. Sun Q., Miao C., Duan Q., Temperature and precipitation changes over the Loess Plateau between 1961 and 2011, based on high-density gauge observations. Global and Planetary Change, 2015, doi:10.1016/j.gloplacha.2015.05.011. Sun Q., Miao C., Duan Q., Kong D., Ye A., Di Z., Gong W., Would the “real” observed dataset stand up? A critical examination of eight observed gridded climate datasets for China. Environmental Research Letters, 2014, 9: 015001, doi:10.1088/1748-9326/9/1/015001.